EDITORIAL – Can we at last put proportional representation to rest? CAN WE NOW put proportional representation to rest? 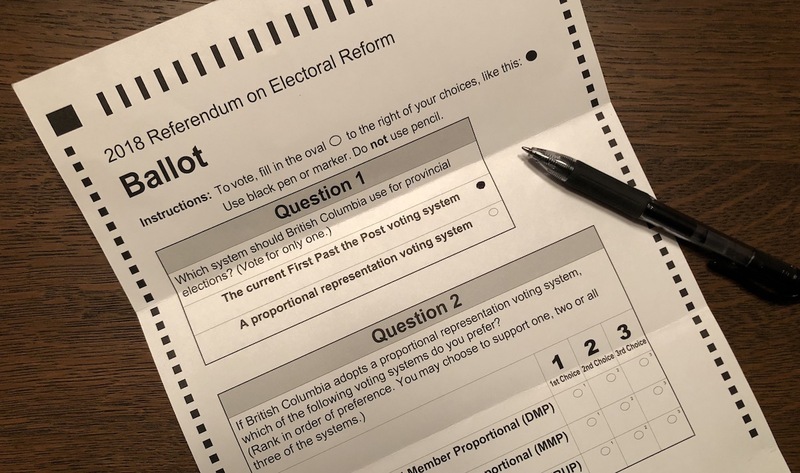 Thursday’s referendum result wasn’t even close — 61.3 per cent of those who voted in the mail-in referendum opted for keeping the First Past the Post system of electing governments in B.C. The turnout, while not overwhelming, was respectable at about 43 per cent. In the Kamloops-North and Kamloops-South Thompson ridings, where Fair Vote Kamloops waged a determined campaign for prop rep, the rejection of the proposed change was higher than the average. Almost 69 per cent of voters in Kamloops-North favoured the status quo; in Kamloops-South it was just over 66 per cent. In the Fraser-Nicola and Cariboo it was even higher. The validity of the result can’t be questioned. This makes the third time in the last 14 years B.C. voters have said no to electoral change. Surely that must be the end of it. But is it? There’s nothing preventing the Greens and the NDP from trying again. And again. Finance Minister Carole James says electoral change is “finished” and that the government will conduct the next provincial election under First Past the Post. But can the NDP and Greens truly give up the dream? It’s obvious how they blew it. They over-reached. They used a process they thought would guarantee victory for prop rep but it was way too cute. Had there been full information and a simple one-question ballot, who knows what might have happened? There will be a lot of “what ifs” to digest. But if the Greens and NDP, or Fair Vote folks, think for a moment British Columbians are in the slightest bit interested in going through this torture a fourth time, they’re badly mistaken. 9 Comments on EDITORIAL – Can we at last put proportional representation to rest? CAN WE AT LAST PUT PR TO REST? NO, and who is ” WE”? Or, as noted above, a future government will just jam it down our throats a la the never-ending new and increased taxes and out-of-control spending, now euphemistically termed as “investment” by all governments. I can’t wait until Weaver has his meltdown just to get some attention seeing as all his big ideas have been basically done, shot down or just didn’t work. “The validity of the result can’t be questioned”. Well, you did, claiming weeks ago that the process was flawed. I asked a while ago (in Milobars column) if the no side wins, whether we should have another referendum. How say you now? There’s a difference between the result and the process. The process was deeply flawed but there can be no doubt that British Columbians overwhelmingly rejected prop rep despite the process. If the process was deeply flawed, how can the result be valid? Because there’s no question about which system was favoured by voters, even though the government did it’s best to stack the process in favour of prop rep.
Now we can all go back to the things that matter most like Christmas shopping, or the hockey season, or frivolity in general. I certainly hope Carole James is wrong! An analysis of possible reasons why the results this time are little different than 2009 will undoubtedly reveal a number of possibilities, not the least of which is the innate power of incumbency, followed closely by the more practiced vote of an older generation which is more averse to change than is a younger. But the oldsters will die off, the younger will become more alarmed at the continuing unrest and disillusionment in the dwindling voters, and the seeds of lack of democratic principles (such as the inequality of the value of votes under FPTP) that have been sown in this referendum will prompt another referendum or possibly even a legislated change to Pro-rep. We just need one successful provincial example, and the rest will follow. Possibly even at the federal level as well. At my age, well beyond the average shelf life of mortality, I have now chalked up a third, and undoubtedly a final, campaign for such a vital change in our provincial electoral system, but I hope that it offers a model for my descendants in the future. If at first — then second — then third– you don’t succeed, then there’s always a possibility that a fourth will be successful.